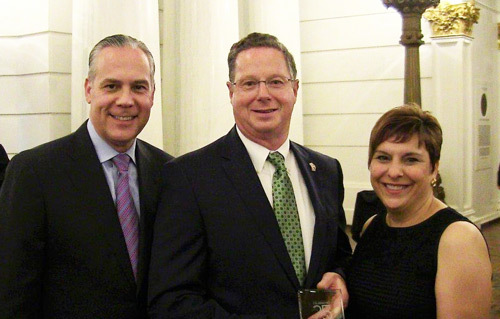 Rep. Stan Saylor (R-York) was recognized with a 2017 Champions for Children Award by Pennsylvania Partnerships for Children (PPC) in recognition of his leadership over the years to improve public policies and increase state investments that benefit the Commonwealth’s children. PPC presented Saylor with the award in conjunction with its 25th anniversary celebration at the state Capitol on Monday evening. Also pictured are PPC Chairman of the Board Michael Warfel and PPC President and CEO Joan Benso. Pennsylvania Partnerships for Children works to improve the health, education and well-being of children and youth in the Commonwealth. PPC is statewide, independent, non-partisan and nonprofit.